In Captain Sonar, up to eight players take on roles manning a submarine in a fierce battle against rival players. In Captain Sonar, up to eight players take on roles manning a submarine in a fierce battle against rival players. 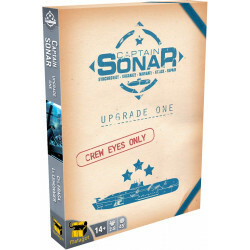 Captain Sonar: Upgrade One adds new elements to the base game, including five new scenarios, two new weapons, eight erasable markers, and different ways to play the Captain and Radio Operator roles.